Praise for SUPERBETTER the book! | you found me. Praise for SUPERBETTER the book! Check out what others have to say about SUPERBETTER the book, and then join the movement (and the fun!) by pre-ordering it now! Help your company get superbetter with a 40% discount on orders of 100 copies or more via CEOReads! 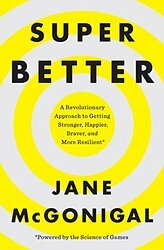 “At the heart of SUPERBETTER is a simple and potentially transformative idea: We can use the same psychological strengths we display when we play games to confront real-life challenges, whether it’s illness, injury, or just changing our habits for the better. Grounded in research and informed by McGonigal’s own sometimes harrowing experiences, this book will make you stop and think, then get you to act.” – Daniel H. Pink, bestselling author of Drive and A Whole New Mind. “You can’t think your way out of a problem, but you can work your way out of a problem. SUPERBETTER shows us that it’s also possible, and maybe even healthier, to play your way out of a problem. Especially if you’re a silly person, like me or Stephen Hawking.” – Rob Delaney, comedian and author of Rob Delaney: Mother. Wife. Sister. Human. Warrior. Falcon. Yardstick. Turban. Cabbage.